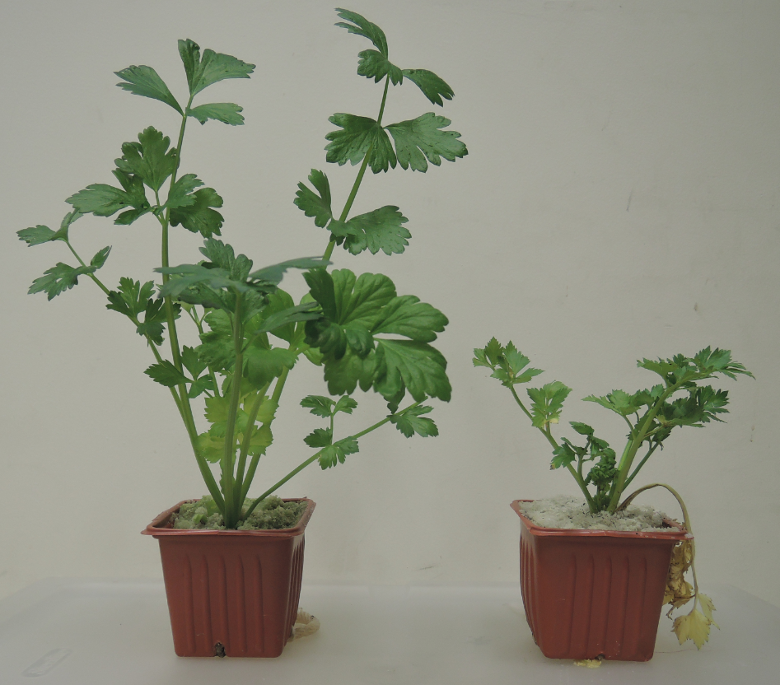 Nitrogen deficient celery plants have stunted growth with pale green foliage. The older leaves turn yellow and senesce early [N24]. Nitrogen deficiency can cause pithiness [N6], although this may also be caused by water stress [N2]. Insufficient N can also result in a reduced proportion of large stalks [N17]. Healthy celery (left) and N deficient celery (right). Photo by Patricia Lazicki. Excess N creates a greater risk for leaching of nitrate past the rootzone which increases the risk of contamination of groundwater resources. Nitrate is easily leached below the root zone with excess irrigation water, so the test may overestimate available N if a heavy irrigation or rainfall occurs [N11] . Therefore, soil nitrate tests should be made immediately prior to a sidedress or drip application of nitrogen. Soil nitrate tests tend to be most beneficial early in the season, and obtaining and responding to multiple in-season analyses can be logistically difficult. Therefore, a general recommendation is that growers begin by sampling before the first in-season application; further sampling later in the season can be added as growers gain experience with the technique [N14]. Soil samples are taken from the top foot of the soil profile, where active roots are most concentrated. Celery roots can penetrate as deeply as 2 feet, but almost all of the activity is in the top foot, especially when the celery is well-irrigated [N3,N7,N18]. Zones of recently banded fertilizer applications should be avoided so that N availability is not over- estimated [N10]. For more information on sampling procedure see Soil Sampling for Nitrate Determination. Soil samples can be sent to a laboratory or extracted and analyzed on the farm. The soil nitrate quick test with colorimetric test strips is highly correlated with the standard laboratory technique and is a reliable estimate of current soil N status. Although the quick test is less accurate than a standard laboratory analysis, its accuracy is generally sufficient for routine on-farm use when done correctly. With the quick test, soil nitrate can be determined in a timely manner in order to make N fertilization decisions [N8,N12,N15]. For the soil nitrate quick test, 30 mL of a calcium chloride (0.01 M) or an aluminum sulfate (0.025 M) solution are measured into a clean 2-oz bottle or centrifuge tube with a mark at 40 mL. Field moist soil is added until the extractant reaches the mark. The tube is then capped and vigorously shaken for about 1 minute to disperse all soil aggregates. The soil particles are allowed to settle until clear supernatant forms. The nitrate concentration in the supernatant can then be measured with nitrate-sensitive colorimetric test [N12,N15]. More detailed instructions can be found here. Several studies carried out in commercial fields of celery and other cool-season vegetables on the Central Coast found that no fertilizer N is necessary as long as the soil nitrate-N level is above 20 ppm (=20 mg/kg) [N8,N12]. A concentration of 20 ppm nitrate-N in the top foot of soil equals approximately 80 lbs N/acre. Celery N demand peaks at about 35 lbs N/acre/week, two weeks prior to harvest [N9]. Thus, if no leaching occurs, a soil with 20 ppm nitrate-N concentration could support celery growth for at least two weeks, even at maximum uptake. If the nitrate-N concentration in the soil is below 20 ppm, only enough fertilizer N to increase the nitrate-N level to 20 ppm is needed (see Soil Applied N). Contact your local farm advisor for more information. Samples are taken from the entire field. Variable fields should be divided into uniform blocks, which are sampled separately [N11]. It is important to accurately determine the crop growth stage, since the total nutrient concentration declines as crops develop [N6]. The entire leaf or petiole of the newest fully elongated leaf (the youngest leaf that has reached a dark green color) is sampled. At least 20 samples should be taken. Once tissue samples are collected, they should be dried as quickly as possible [N11]. For more information on sampling procedure see Plant Tissue Sampling. Plant tissue can be analyzed for total nitrogen or nitrate-N concentration. The total N concentration of whole leaves indicates the longer-term N availability, while the petiole nitrate-N concentration reflects more the current conditions [N11] (see Table). Total N concentration is considered a better measure to monitor crop N status; however, this technique has not been widely used in the California vegetable industry [N11]. Tissue testing may be able to identify deficient plants, but doesn’t show if excess N is present. For this reason, it's necessary to combine tissue tests with soil analysis and N budgeting [N9]. For more information, contact your local farm advisor. Approximate minimum tissue sufficiency levels for celery [N11]. Sap nitrate may also be tested on-farm, using the Cardy nitrate meter. While not as accurate as lab testing, it can give approximate values. Instructions may be found here. Celery requires little N in the early phase of growth, and N fertilizers applied prior to planting are at risk of leaching, causing yield and quality reductions and groundwater pollution [N6]. To prevent N stress during early growth, small quantities of N (20-30 lbs/acre) are generally applied pre-plant or at planting [N5]. When too much N is applied before the crop can take it up, it may be leached or subsequent irrigations may move much of this N out into the furrow, where celery has very few roots [N3]. The initial N application is often broadcast and incorporated prior to planting as a granular N and P fertilizer [N22]. For vegetables in general, banding starter fertilizer is considered more effective than a broadcast application, especially when soils are cool at planting. Bands should be located two inches to the side and two inches below the roots of the transplants [N23]. Transplant roots may also be dipped in a low-N, high-P starter solution, or such a solution can be added to the transplant water [N16]. See Starter P for more details. Celery, which has a shallow root system, a long growing season and high irrigation and N requirements, can lose a lot of nitrate-N by leaching even under careful management [N7]. Nitrification inhibitors and controlled release fertilizers (CRFs) both aim to reduce nitrate leaching by slowing the rate at which nitrate-N is released to the soil. Research trials on celery [N1,N25] and lettuce, another shallow rooted crop [N20], suggest that when well managed, some of these products may have potential to reduce leaching losses and increase yields and N use efficiency. Controlled-release products are likely to be most useful in years with high rainfall [N1,N13]. However, more research is needed to determine how reliable these technologies are, the best ways of using them, and whether or not they can be profitable. For example, Feigin and colleagues [N7] observed that applying urea ammonium nitrate continuously through a drip system gave better celery yields and N use efficiency than applying a CRF pre-plant, because the N from the CRF used was not released quickly enough for celery uptake. More information on common fertilizer types, including nitrification inhibitors, can be found at the website of the International Plant Nutrition Institute. Pre-plant N applied in fall is not recommended as the nitrate is highly susceptible to leaching below the root zone by winter rain [N5]. To ensure that N is available in the root zone of young plants, the irrigation management needs to be optimized to prevent nitrate movement below the root zone [N9]. Nitrogen applied early in the season to celery is easily lost by leaching, and split N applications generally improve yields and reduce N losses [N6,N21,N26]. The required N rate depends on soil nitrate content. Several studies carried out in commercial fields of celery and other cool- season vegetables on the Central Coast found that when the pre- sidedress soil nitrate-N level is above 20 ppm, no fertilizer N is necessary [N8,N12]. If the nitrate-N concentration in the soil is below 20 ppm, only enough N to increase soil available nitrate-N to 20 ppm is needed. Approximately 4 lbs N/acre need to be added to increase the soil nitrate level by 1 ppm [N12]. As an example, when the soil nitrate-N concentration is 15 ppm, 20 lbs N/acre are needed to increase the level to 20 ppm. Hartz [N11] recommends that early sidedress applications not exceed 60 lbs N/acre each, to reduce the risk of leaching losses. Celery crops planted in late summer or fall, following another vegetable crop, require less fertilizer than crops planted in early spring because soil residual N is higher [N3,N11]. A general recommendation is that if preplant and early sidedress applications are kept low and irrigation is efficient and uniform, about 220-260 lbs N/acre is sufficient for winter/spring celery, and 180-220 lbs N/acre for summer/fall celery [N11]. However, Holden [N17], on a recent trial on commercial drip irrigated winter celery fields on a clay loam soil in Ventura County, observed that when the grower standard rate of 400 lbs N/acre was reduced by 75%, yields and celery stalk size tended to be slightly reduced [N17]. Contact your local farm advisor for more information. In addition to residual soil nitrate, nitrate in the irrigation water should be accounted for to reduce the amount of N fertilizer applied. Nitrogen mineralization from soil organic matter and crop residues also add to available soil N [N3]. Net N mineralization is generally higher after broccoli or cauliflower than after lettuce [N11]. See Factors affecting Soil Nitrate Concentrations in Spring. These factors are taken into account by CropManage, a web-based irrigation and N management software tool developed by Cahn and coworkers [N4]. CropManage can be accessed here, and a description of the program is available here. Where drip or sprinkler irrigation are used, in-season N is normally fertigated. It's most efficient to inject N at the end of the irrigation run, such that only 30-40 minutes are left after injection to flush the fertilizer from the system [N9]. With furrow irrigation it is better to band or topdress N, since furrow-run N is less likely to be uniformly distributed. Fertilizer is sometimes topdressed under the drip tape, just before drip tape installation, and then washed into the root zone with irrigation water. However, not more than 20-50 lbs N/acre should be applied in this way, since the crop does not take up much N until later in the season [N9]. See Time of Application for more information. Little information on the effect of foliar N application is available. Nitrogen is only applied when the pre-sidedress soil nitrate-N concentration is below 20 ppm (see above). Application rates should reflect crop uptake. Early in the season, N uptake is low and the plant’s demand is covered by residual soil N and starter N or pre- plant N [N6]. Only about 20-30 lbs N/acre are needed for the first month after transplanting, prior to drip installation [N5,N9]. Celery N demand increases as the crop matures, peaking at 35 lbs N/acre/week in the two weeks prior to harvest [N9]. Sidedress applications should therefore be lower for younger plants. Leaves of P-deficient celery plants are dark bluish green. The plants are small, and the older leaves turn yellow and senesce early, similarly to N deficiency [P18]. Excess soil P concentrations can reduce Zn uptake [P2]. Since available P and K levels do not change rapidly, soils can be tested any time between crops [P8]. Soil samples are taken from the top foot of the soil profile, which is the major rooting zone. Celery roots can penetrate as deeply as 2 feet, but almost all of the activity is in the top foot, especially when the celery is well-irrigated [P1,P5,P10]. Zones of recently banded fertilizer applications should be avoided so that N availability is not over- estimated [P6]. For more information on sampling procedure see Soil Test Sampling. 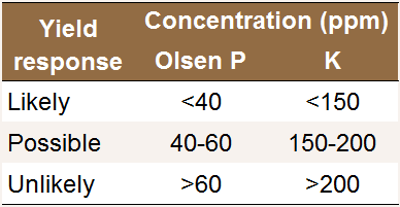 In California, the available soil P is generally determined on sodium bicarbonate extracts (Olsen-P test). This test is appropriate for soils with a pH between 5.5 and 8.5 containing less than 3% of organic matter [P13]. For information about the appropriate P test when your soil is outside of this range, contact your local farm advisor. Soil test interpretation for celery (top foot of soil) [P8]. A crop response is likely when the soil has an Olsen P value of less than 40 ppm. Between 40-60 ppm a response is possible, especially for cool season crops in the early spring. Over 60 ppm, a response is unlikely [P8]. When celery is grown in the summer, slightly lower critical values for soil P and K should be used [P13]. Samples are taken from the entire field. Variable fields should be divided into uniform blocks, which are sampled separately [P7]. The petiole below the first node of newest fully elongated leaf (the youngest leaf that has reached a dark green color), or the whole leaf, including the petiole, are sampled. At least 20 samples should be taken. Once tissue samples are collected, they should be dried as quickly as possible [P7]. For more information on sampling procedure see Plant Tissue Sampling. Adequate P range for the petiole below the first node of the newest fully elongated leaf, or the whole leaf, including the petiole . Phosphorus application rates should be based on soil test results. No P should be added when soil Olsen-P values are above 60 ppm. Below this level, the P removed with the harvested celery may be replaced [P3]. Celery in the Salinas Valley typically contains about 90-100 lbs P2O5/ acre (40-45 lbs P/acre) at harvest [P14]. However, only about 70% of the P is removed as marketable yield [P5]. Therefore, to replace the P removed from the field with one crop, 63-70 lbs P2O5/acre (28-30 lbs P/acre) are required. This is in line with the UC recommendation that 40 to 80 lbs P2O5/acre be applied for soils with moderate P levels [P3]. Higher rates may be required for low testing soils. Regular soil and leaf analyses indicate whether the P fertilization program is adequate or should be modified to maintain optimal P availability. For more information, contact your local farm advisor. Phosphorus fertilizer is often broadcast at bed formation. Broadcast P needs to be incorporated into the soil because P is immobile in the soil [P12]. Injected bands of P fertilizer are thought to be more available than broadcast applications [P12]. However, no trials have been performed in California to determine whether banding increases celery P use efficiency, and broadcasting is commonly practiced [P15]. Banding is most likely to be beneficial when soils are cold at planting and P movement in the soil is limited, and in acidic or alkaline soils, as P is less available at high and low pHs. A number of granular and liquid P fertilizers are available. Fact sheets of the most common fertilizers can be found on the web site of the International Plant Nutrition Institute. Pre-plant P fertilizers are generally best applied close to the time of planting since P may interact with soil minerals becoming less available over time [P12]. The further away soil pH is from neutral, the more strongly P interacts with soil minerals. Banding some starter P at planting is generally more efficient than broadcasting the whole rate pre-plant for most vegetable crops, since it places a high concentration of P close to the developing roots [P12]. However, an experiment in south Florida found no benefit from banding P at transplanting compared to incorporating P during bed preparation [P4]. The effect of adding some starter P to celery at transplanting has not been researched in California, and broadcasting is commonly practiced [P15]. In general P is less available in cold soils and in acid or alkaline soils, and including some starter P is most likely to be beneficial in those environments. In cooler climates, a common recommendation is to dip transplants in a high-P starter solution such as 11-48-0 or to use a similar starter solution in the transplant water [P10,P19]. If a starter band is used, it should be located at least two inches to the side and two inches below the transplant roots [P17]. If a starter dip is used, the University of Oregon recommends up to 3 lbs of 11-48-0 or 11-55-0, dissolved in a 55-gal drum of water [P10]. Phosphorus is most commonly applied at or before planting; however, in-season applications are also practiced [P12,P16]. If P is required in-season to correct deficiencies, it may be side-dressed or added with irrigation water. Phosphorus can form precipitates that block emitters, and care should be taken to choose a P fertilizer that is compatible with the irrigation water chemistry [P2]. Leaves of K deficient celery plants are a dark bluish green color. The leaves curl backwards and the margins first turn yellowish, then brown. Plants are short [K15]. Potassium deficient celery is on the right. Photo by Patricia Lazicki. Potassium deficient celery leaves showing marginal necrosis. Photo by Patricia Lazicki. Soil samples are taken from the top foot of the soil profile, which is the major rooting zone. Celery roots can penetrate as deeply as 2 feet, but almost all of the activity is in the top foot, especially when the celery is well-irrigated [K1,K5,K10]. Zones of recently banded fertilizer applications should be avoided so that K availability is not over- estimated [K6]. For more information on sampling procedure see Soil Test Sampling. To determine plant available K, soil samples are most often extracted with an ammonium acetate solution [K11]. Soil test interpretation for celery (top foot of soil) [K8]. Celery responds to fertilizer K at relatively high soil K levels, compared to most other cool season vegetables. A crop response is likely when the soil has an exchangeable K value of less than 150 ppm. Between 150-200 ppm a response is possible. Over 200 ppm, a response is unlikely [K8]. When celery is grown in the summer, slightly lower critical values for soil P and K should be used [K11]. In addition to the exchangeable K content, competition with other cations may affect K uptake by plants. In soils where K makes up less than 2% of exchangeable cations, K uptake may be restricted [K14]. Samples are taken from the entire field. Variable fields should be divided into uniform blocks, which are sampled separately [K7]. It is important to accurately determine the crop growth stage, since the total nutrient concentration declines as crops develop [K4]. The leaves or petiole of the newest fully elongated leaf (the youngest leaf that has reached a dark green color) are sampled. At least 20 samples should be taken. Once tissue samples are collected, they should be dried as quickly as possible [K7]. For more information on sampling procedure see Plant Tissue Sampling. 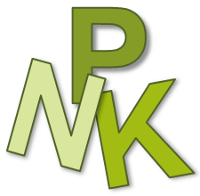 Adequate P range for the petiole below the first node of the newest fully elongated leaf, or the whole leaf, including the petiole [K10]. The K application rate should be based on soil test results. Celery grown in soils with greater than 200 ppm of ammonium acetate exchangeable K is unlikely to respond to K fertilization. When the soil K test level contains adequate K, the K removed with the harvested crop should be replaced [K3]. Celery takes up more K than other cool-season vegetables. At harvest a typical celery crop contains about 420-540 lbs K2O/acre (350-450 lbs K) [K13], although amounts as high as 760 lbs K2O/acre have been observed [K16]. However, only about 70% of the K is removed as marketable yield [K4]. Therefore, to replace the K removed from the field, typically 290-380 lbs K2O/acre (245-315 lbs K) are required. Higher rates may be needed for soils with less than 150 ppm exchangeable soil K.
In fields with very low soil test values, the application rate may be increased, especially when leaf analyses also indicate that K supply is insufficient. A higher application rate may also be necessary in very sandy soils where K leaching may increase the amount of K exported from the field. In these soils, leaching can be reduced by split applications. Potassium fertilizers are most commonly applied pre- plant. Pre-plant applications can be broadcast and incorporated into the soil or banded. In drip irrigated fields, K can also be applied by fertigation during the growing season. Celery takes up most of the K during the second half of its growth cycle [K16], which is the time when the K supply needs to be adequate. Potassium chloride (KCl), potassium sulfate (K2SO4)and potassium thiosulfate are the three forms of K used in vegetable production. 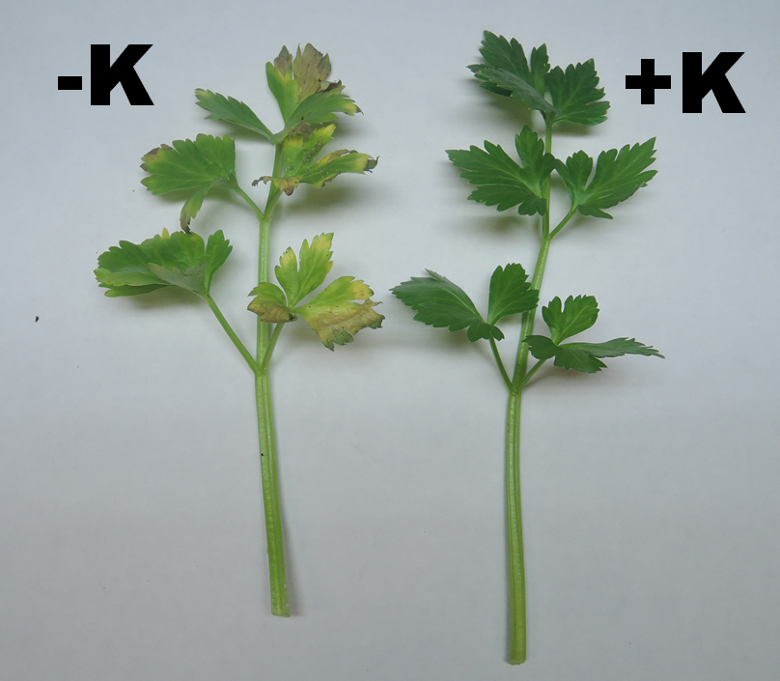 Greenhouse experiments suggest that celery yields may be higher with KCl than with potassium sulfate [K9], and that KCl may help reduce infection by the disease fusarium yellows [K12]. For fertigation, KCl is generally preferred over K2SO4 due to its higher solubility. However, salt concerns in most of the celery production districts limit the use of KCl due to the high concentration of chloride which can increase levels of deleterious salts to the soil. Fact sheets of the most common fertilizers can be found on the web site of the International Plant Nutrition Institute. Bendixen, W., 1998. Evaluation of controlled release fertilizers and fertigation in strawberries and vegetables. FREP Final Report. Breschini, S.J., Hartz, T.K., 2002. Drip irrigation management affects celery yield and quality. HortScience 37, 894-897. Buchanan, M., 2001. Evaluating and demonstrating the effectiveness of in-field nitrate testing for drip and sprinkler irrigated vegetables. FREP final report. Cahn, M., Hartz, T., 2012. Irrigation and nitrogen management web-based software for lettuce production. FREP Conference Proceedings 2012, 18-22. Daugovish, O., Smith, R., Cahn, M., Koike, S., Smith, H., Aguiar, J., Quiros, C., Cantwell, M., Takele, E., 2008. Celery production in California. UC Division of Agriculture and Natural Resources, Publication 7220. Feigin, A., Letey, J., Jarrell, W.M., 1982a. Celery response to type, amount, and method of N-fertilizer application under drip irrigation. Agronomy Journal 74, 971-977. Feigin, A., Letey, J., Jarrell, W.M., 1982b. Nitrogen utilization efficiency by drip irrigated celery receiving preplant or water applied N fertilizer. Agronomy Journal 74, 978-983. Hartz, T., 1998. Evaluation of pre-sidedress soil nitrate testing to determine N requirements of cool season vegetables. FREP Final Report. Hartz, T. 2000. Drip irrigation and fertigation management of celery. Vegetable Research and Information Center, Celery Grower Guidelines 2000. Hartz, T.K., 2006. Vegetable production best management practices to minimize nutrient loss. HortTechnology 16, 398-403. Hartz, T.K., 2007. Efficient nitrogen management for cool-season vegetables. Hartz, T.K., Bendixen, W.E., Wierdsma, L., 2000. The value of presidedress soil nitrate testing as a nitrogen management tool in irrigated vegetable production. HortScience 35, 651–656. Hartz, T.K., Smith, R.F., 2009. Controlled-release fertilizer for vegetable production: The California experience. HortTechnology 19, 20-22. Hartz, T., Smith, R., 2012. In-season soil nitrate testing explained. UCCE Monterey County Crop Notes July/August 2012, 6-7. Hartz, T.K., Smith, R.F., Schulbach, K.F., LeStrange, M., 1994. On-farm nitrogen tests improve fertilizer efficiency, protect groundwater. California Agriculture 48(4), 29-32. Hemphill, D., 2010. Celery. Oregon State University Department of Horticulture. Holden, D., 2015. Nitrogen reduction project, Oxnard, California, Final Report. California Celery Research Advisory Board Fall-Winter 2014-2015. Janes, B.E., 1959. Effect of available soil moisture on root distribution, soil moisture extraction and yield of celery. Proceedings of the American Society for Horticultural Science 74, 526-538. Santamaria, P., Elia, A., Serio, F., Gonnella, M., Parente, A., 1999. Comparison between nitrate and ammonium nutrition in fennel, celery, and Swiss chard. Journal of Plant Nutrition, 22, 1091-1106. Smith, R., 2012. Nitrification inhibitors and controlled release fertilizers. Stark, J.C., Jarrell, W.M., Letey, J., 1982. Relationship between growth and nitrogen fertilization of celery. HortScience 17, 754-755. Takele, E., Daugovish, O., Vue, M., 2013. Costs and profitability analysis for celery production in the Oxnard Plain, Ventura County, 2012-2013. UC ANR Cost Study. University of California Small Farms Program, 2012. Fertilizing vegetables: Celery. Van Wassenhove, F.A., Dirinck, P.J., Schamp, N.M., Vulsteke, G.A., 1990. 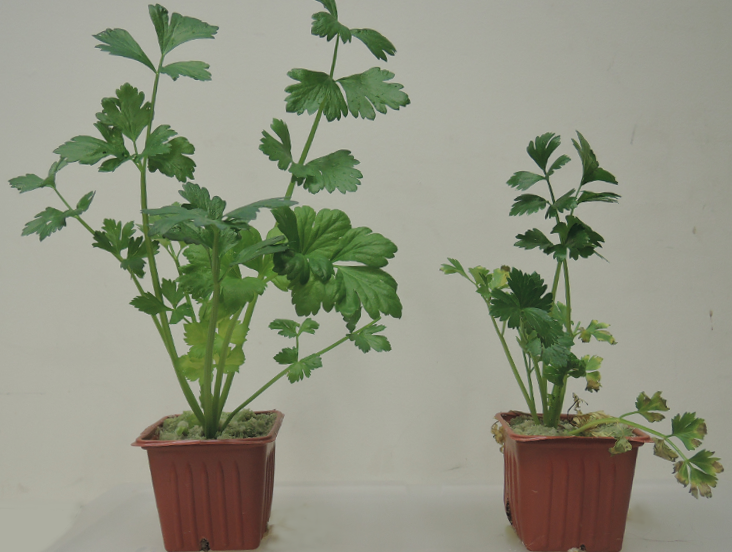 Effect of nitrogen fertilizers on celery volatiles. Journal of Agricultural and Food Chemistry 1990, 220-226. Wallace, T., 1943. The diagnosis of mineral deficiencies in plants by visual symptoms. His Majesty’s Stationery Office, London. Welch, N.C., Tyler, K.B., Ririe, D., Broadbent, F.E., 1979. Nitrogen stabilization in the Pajaro Valley in lettuce, celery, and strawberries. California Agriculture 33(9), 12-13. Welch, N.C., Tyler, K.B., Ririe, D., Broadbent, F.E., 1985. Nitrogen rates and nitrapyrin influence on yields of brussels sprouts, cabbage, cauliflower, and celery. HortScience 20, 1110-1112. California Plant Health Association, 2002. Western Fertilizer Handbook 9th edition. Interstate Publishers, Inc.
Espinoza, L., Sanchez, C.A., Schueneman, T.J., 1993. Celery yield responds to phosphorus rate but not phosphorus placement on Histosols. HortScience 28, 1168-1170. Hartz, T.K., 2007a. Efficient nitrogen management for cool-season vegetables. Hartz, T.K., 2007b. Soil testing for nutrient availability: Procedures and interpretation for California vegetable crop production. UC Vegetable Research and Information Center. Pettygrove, S., Hartz, T., Hanson, B., Jackson, L., Smith, R., Lockhart, T., Grattan, S., 2003. Nutrient management in cool-season vegetables. University of California Division of Agriculture and Natural Resources Publication 8098. Reisenauer, H.M., Quick, J., Voss, R.E., 1976. Soil test interpretive guides. In: Reisenauer, H.M. (Ed.). Soil and Plant-Tissue Testing in California. University of California Cooperative Extension Bulletin 1879. pp. 38-40. Smith, R., Cahn, M., Hartz, T., 2009. Farming closer to the edge. Monterey County Crop Notes July/August 2009, p. 4-6. United States Department of Agriculture National Agricultural Statistics Service. QuickStats. Accessed January, 2016. Zandstra, B.H., 1986. Commercial Vegetable Recommendations: Celery. Michigan State University Cooperative Extension Service E-1308. Inthichack, P., Nishimura, Y., Fukumoto, Y., 2012. Effect of potassium sources and rates on plant growth, mineral absorption, and the incidence of tip burn in cabbage, celery and lettuce. Horticulture, Environment and Biotechnology 53, 135-142. Schneider, R.W., 1985. Suppression of fusarium yellows of celery with potassium, chloride, and nitrate. Phytopathology 75, 40-48. Smith, R., Pettygrove, S., 2011. Potassium fertility of Salinas Valley soils. Salinas Valley Agriculture. Zink, F.W., 1966. Celery growth and nutrient absorption studies. California Agriculture 20 (7), 10-10.